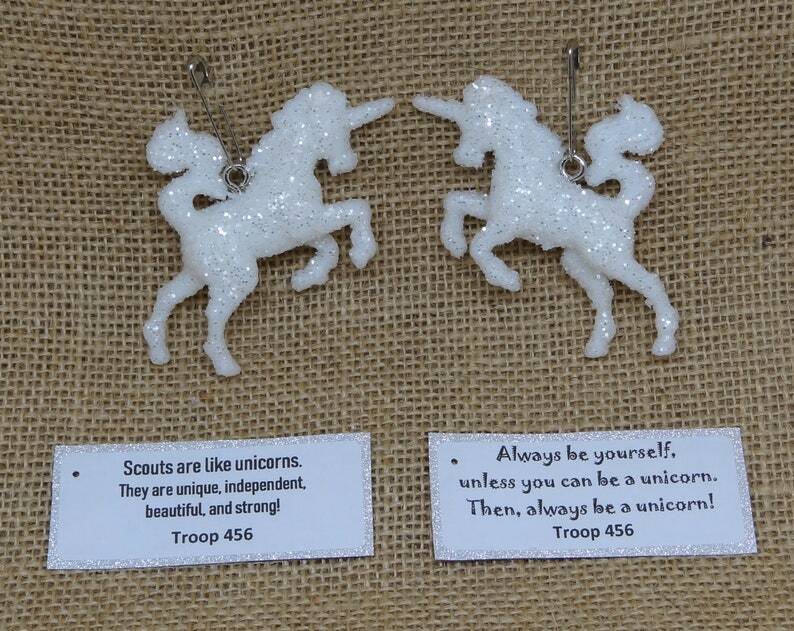 For sale is one (1) set of ten (10) Unicorn Scout SWAP or Craft Kits. Who doesn’t like unicorns?!?! These glittery, fantastical SWAPs will appeal to all your scouts. Unicorns represent uniqueness, independence, beauty, and strength – all are qualities we want to instill in our scouts. Each kit contains all the supplies necessary to make one SWAP or ornament. NO ADDITIONAL SUPPLIES NECESSARY. All SWAP kits include free personalized tags. Just send us a message with your desired text, and we’ll do the rest. There are lots of great tag ideas for these SWAPs. Here are a few suggestions. However, you can change this text and/or add personalized information like troop number, name of event, etc.